Sure Print & Design provides customized book and publication printing services. With their new Drupal website they wanted to be able to offer their clients the ability to order online in an easy and intuitive way. Sure Print approached us with a unique problem : their existing Drupal site was out-of-date and they desperately needed to modernize the design and layout to make it easier for clients and end-users to order printing packages online. We developed wireframes first, allowing the customer to collaborate easily towards a new layout for each page throughout the website. We then created mock-ups based on the approved wireframes. The client then collaborated with us heavily to ensure the design vision was fully met. Ultimately we created a custom Drupal theme based on the approved mock-ups. 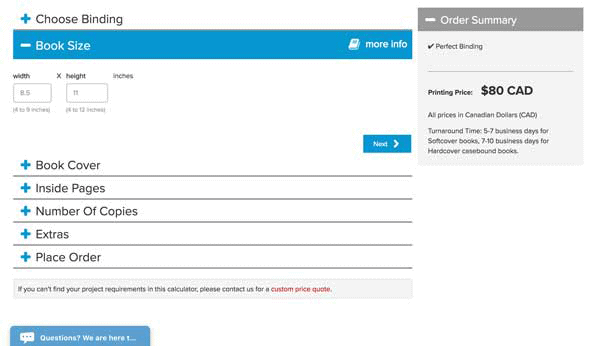 We implemented a custom online ordering system for Sure Print & Design, this allows users to create very detailed orders on line. The system lets users specify granular details such as paper type, paper weight, binding type, whether they want their designs printed in black and white, spot colour or full colour, the quantity of the job as well any important timelines for the project. This was a challenge simply because of the number of options, addons, discounts and other conditions that all impact the price of each order choice. As soon as you start adding options to options in e-commerce, the number of complex conditions exponentially increases. We worked stringently with the client every step of the way to test, re-test and ensure the transition to their new ordering system was stable.